There is a reason that The Ocean Course at Kiawah Island is 3rd on Golf Digest’s ‘America's 100 Greatest Public Courses’, it is a truly phenomenal course and a must-play for any golfer. The Ocean Course has played host to the Ryder Cup and PGA Championship in its illustrious history, however, there are four other championship courses at the resort; Turtle Point, Osprey Point, Oak Point and Cougar Point, that are all worthy of a round in their own right. The combination of these fantastic courses makes Kiawah Island one of the best golf resorts in America. Kiawah Island sits on the sunny South Carolina coast, enjoying a year-round golfing climate. Fly into Charleston International Airport and enjoy the drive through the coastal ‘islands’, in under an hour you’ll reach the Kiawah Resort. Once there you have the choice of two outstanding accommodations; The Sanctuary, a 225-room luxury hotel or The Villas, gorgeous private residences that make a holiday extra special. The resort boasts a number of state of the art facilities such as incredible dining options, tennis courts, spa and wellness centre. A stay here guarantees the holiday of a lifetime. One of the greatest accolades that the Ocean Course at Kiawah Island has in it's locker is that it is one of only four courses to have hosted all of the US PGA Major Tournaments after the 2012 PGA Championship was staged there, in which Rory McIlroy set the course a light and won by a record 8 strokes. 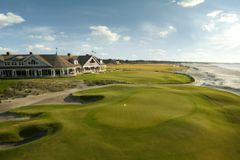 The Ocean Course at Kiawah Island is also engraved in golfing history due the plethora of other excellent tournaments that have been staged there. The 2007 Senior PGA, the 1997 and 2003 World Cups, and the 2001 UBS Cup have all graced the Ocean, but the highlight without a doubt was the 1991 Ryder Cup matches, dubbed ‘The War on the Shore', which culminated with Bernhard Langer missing ‘that putt'. The standard of Pete Dye's 1991 creation, which is frequently buffeted by the prevailing Atlantic winds. Ten holes track the coastline, with the remaining eight running parallel just inland, making it one of the world's most spectacular courses, and also one of the most desirable destinations for the true golf aficionado. The Osprey Point Course is one of the resort’s most popular courses for resort guests. Idyllic Forests, Lagoons and Saltwater marshes make The Osprey Course a fantastic track. In 2014, the course underwent a mega renovation spearheaded by renowned course architect Tom Fazio. The course is now one of the finest golfing layout’s in South Carolina and has won countless awards including ranked 10th in 50 Best Courses for Women by Golf for Women and it also was awarded a near perfect 4 ½ stars in Golf Digest’s “ Best Places to Play”. Osprey Point should not just be known for an excellent course but also for a very elegant clubhouse where you can enjoy a post round drink or a bite to eat. It is also a fantastic venue for Wedding receptions and special functions. Cougar Point is currently under a mega renovation and is set to reopen in 2017. The renovation will address completely re-grassing the greens, tees and fairways, laser levelling all tee boxes including the driving range, redesigning bunkers and updating the irrigation throughout all the course. Cougar’s Point had been recently rated “Golf Course of the Year” by South Carolina Golf Course Owners Association and offers some of the Island’s most spectacular views. The Course was originally designed by Marsh Point, but in 1996 it was re-designed by golfing legend Gary Player. Turtle Point recently reopened after enjoying a mega 9-month renovation that included refurbishing green complexes, re-grassing the greens, tees and fairways, rebuilding all the bunkers, laser levelling all tee boxes and advanced irrigation throughout all the course. The course is now at the best it’s ever been and is becoming very much a favourite for golfers on a Kiawah Island Golf Experience. The course was designed by golfing legend Jack Nicklaus, who has designed 100’s of courses all over the world. Jack has said that his number one goal in designing courses is to “make the player use his mind ahead of his muscles”. Turtle Point certainly reflects Jack’s quote, so be sure to have a thorough read of the course planner before hitting the fairways. The Resort purchased Oak Point in 1997, making Kiawah Island home to 5 stunning golf courses and also one of the World’s most impressive golf resorts. In 2015, the course underwent a large-scale renovation making it on the same level as the resort’s other championship golf courses. The course was designed by Clyde Johnston, who has a stellar portfolio of golf courses across the USA and the UK. Hailing from South Carolina, Clyde designed Oak Point on the grounds of a former cotton and indigo plantation. It is highly regarded as a shot making course, where strategy and course management are crucial to avoid trouble and give yourself the best chance of making pars & birdies. The Kiawah Island Resort, while predominantly known for its rich golfing portfolio, also boasts excellent luxury accommodation options, ranging from the luxury beachfront hotel to the intimate private villas. The Sanctuary at Kiawah Island is located on the perfect white sand of Kiawah Island's coastline, and is a luxury retreat that captures the spirit, history and charm inherent to the Charleston area. The 255 guest rooms and suites are equipped with the most exquisite amenities, most notably hand crafted armoires and desks, custom made beds and private seating areas. Having garnered much praise and many coveted accolades, the Sanctuary is the luxury way to experience Kiawah Island. Ranging in size, and boasting distinctive locations and views, the Resort Villas ensure that there is an option to suit every demand. Catering particularly well to larger groups and families, the villas ensure the added privacy that can make a golf holiday that little bit more special. The Sanctuary Luxury Spa is one of only 17 similar facilities in America to be honoured with 4 stars by the Mobil Travel Guide, and its quality is derived from two key facets: the therapeutic value of the extracts of the low country's foundations, such as seaweed and mineral-rich soil, and the old-fashioned values of Southern hospitality. Kiawah Island also boasts the #2 tennis resort in the world, offering tuition for players of all standards, and the latest tennis technology. There is something for everyone at Kiawah - on land, enjoy cycling, hiking and walking, while the swimming pools and the Atlantic offer an endless list of aquatic possibilities. During your visit to Kiawah Island, be sure to head out on one of the charter boats for a deep sea fishing adventure. The Ocean Room is a culinary delight - dishes influenced by the flavours of North Africa, Spain and southern France saw it awarded 4 Diamonds by the AAA. Among the countless dining options, the luxury ice cream and frozen yoghurt at Beaches & Cream is absolutely essential. The accomondation is as good as a five star hotel has to be.